The Ultimate in Fine Manufactured Home Living in Northern California! Conveniently located just north of Mt. 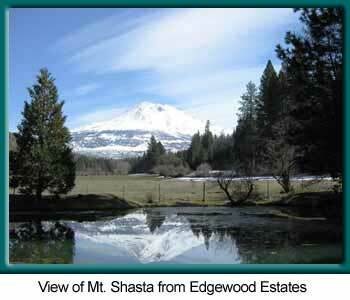 Shasta in Northern California’s majestic Siskiyou County, Edgewood Estates is a northern California manufactured home park that achieves the latest mode in country-style living. Designed for residents aged 55 and older, Edgewood Estates is a gated community which offers the quiet life with privacy and peaceful living assured. The Park incorporates unique green meadows with meandering walkways, apple orchards, picturesque ponds and an unbelievable view of Mount Shasta with her snow tip surroundings and year round glaciers. Edgewood Estates is a 55+ park; a congenial neighborhood where everyone is assured privacy and each home space is designed with specific views of the valley and mountains. Park requirements provide protection of the natural setting in a way provided by no other manufactured home park. We are located less than one-tenth of a mile from one of the area's many golf courses. For additional convenience we are less than a mile from Interstate 5 with easy access in any direction. Your home is assured proper installation with compliance and landscaping in mind. Each home is ground mounted and our selected manufacturers assures the manufactured home owner that each new manufactured home will be placed among other new homes conforming to the highest standards of the Park. You can be assured your neighbor’s effort in his new home will compliment your effort architecturally and aesthetically. The abundant amenities of Siskiyou County and the surrounding area are evident everywhere, but perhaps the area's scenic beauty is the most obvious. Call today for an appointment to view Edgewood Estates!